I love it when this blog serves as a diary. 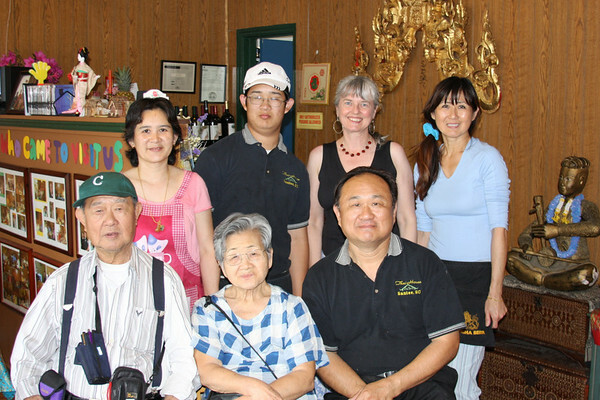 In 2009 I stopped at the tiny Thai House restaurant in Santee for green curry. They had a tradition of posting pictures of their customers on the wall and I turned the tables and had the family join me for a shot. This weekend, ten years later, I realized that they had moved down the road into a larger building and stopped in again to find they still had some of the old pictures. Thanks to the search feature on this blog I was able to pull this shot on my phone and it caused such a joyful reaction. The grandparents had been visiting at the time of the photo and recently passed away. They were delighted to have this three generation shot. Too bad I am in the middle!